The point is, you have to be bad before you can be good. So Doug would like to take this opportunity to say, “Sorry,” to all those customers he performed for during the first 10 years that he was doing shows. But look, you only paid, what, $15 anyway so what did you expect? During the second 10 years, Doug started to get good, but it wasn’t until his third decade of performing that he began to be recognized by his peers as someone who wouldn’t go away. Over the next 15 years Doug spent 23 years performing as the lead magician for Chevrolet on their national auto show tours (living in hotel rooms seems a lot longer than it is, that’s why the math seems goofed up. Trust me. It’s right.) Between shows, Doug travels all over the world lecturing to his peers at some of the most respected magic conventions on the planet: MAGIC Live, in Las Vegas (he did that twice), The Society of Magician’s Convention, Tel Aviv, Israel (that was a one time dealand it was AWESOME), KGB in Hollywood and Orlando (not that KGB, a different one), and to some of the most respected children’s entertainers in Gatlinburg, TN at their annual KIDabra Conference. He’s the only children’s performer to have ever performed in both the Close-up Room and on the Palace Stage on the same day at the prestigious Magic Castle in Hollywood, CA. (Apparently, they didn’t know what to do with him). He’s been invited to perform at the White House during their Easter Egg roll, but he actually turned it down because he had another gig. (The White House wasn’t paying anything….go figure, right?) He still regrets that decision. Sorry Mr. Cheapskate, er I mean Mr. Bush. 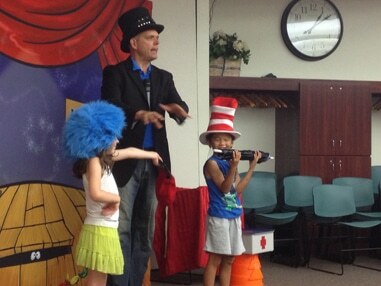 Doug has extensive experience working with special needs children on stage and has authored articles on the topic for performers’ trade journals around the world. Want to read one? Click Here. Doug is the owner of Assembly Shows, Michigan’s premier school show company. 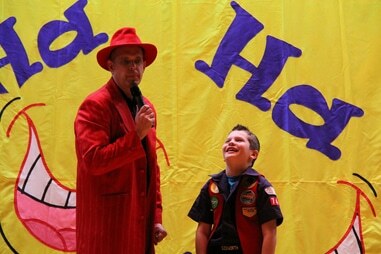 He’s created 12 educational and highly entertaining shows that are seen in elementary schools throughout the Midwest. Currently Doug lives in a castle on a lake in Commerce Township, MI with his trophy wife and three kids. Doug has won numerous body-building titles and is the current weightlifting champion of the universe. Chuck Norris is afraid of Doug and his children call him “The Supreme Ruler.” Doug likes the way play-doh smells and oftentimes thinks about eating a big hunk. Speaking of big hunk, Doug was stalked by Shania Twain in the early 90‘s (it’s hard to believe but at one time Doug was actually reasonably attractive), begging for “just one date,” but he had to refuse since his then current girlfriend was Claudia Shiffer. Doug is a big fan of plastic surgery (but he thinks Meg Ryan looks really bizarre with that weird facelift) and he is considering taking time off work next week so he can get hair transplants on the bottom of his feet. 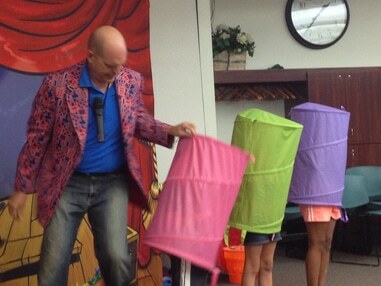 The World’s Funniest Magic Show* is a go-anywhere, perform-anywhere, comedy show for family audiences. 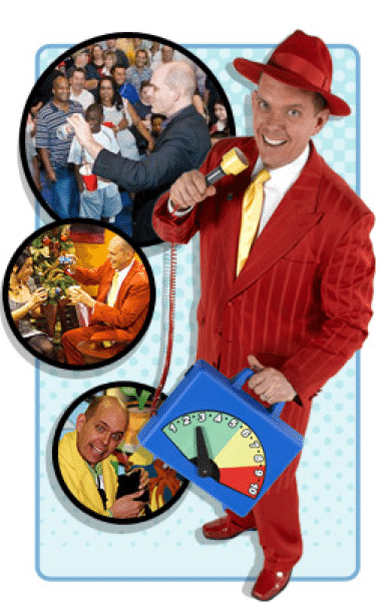 You’ll laugh at the insane stunts, wacky contests, hilarious audience participation, and magic that you’ve never seen anywhere else. Plus this show can be adapted to fit your event!